© 2003, © 2018 by Paul Freeman. Revised 7/1/18. 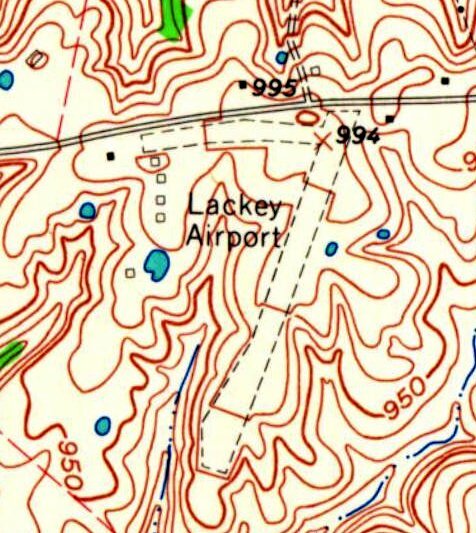 Lackey Airport, as depicted on the 1965 USGS topo map. which depicted a single northeast/southwest unpaved runway, with a taxiway leading to 5 small buildings on the northwest side. 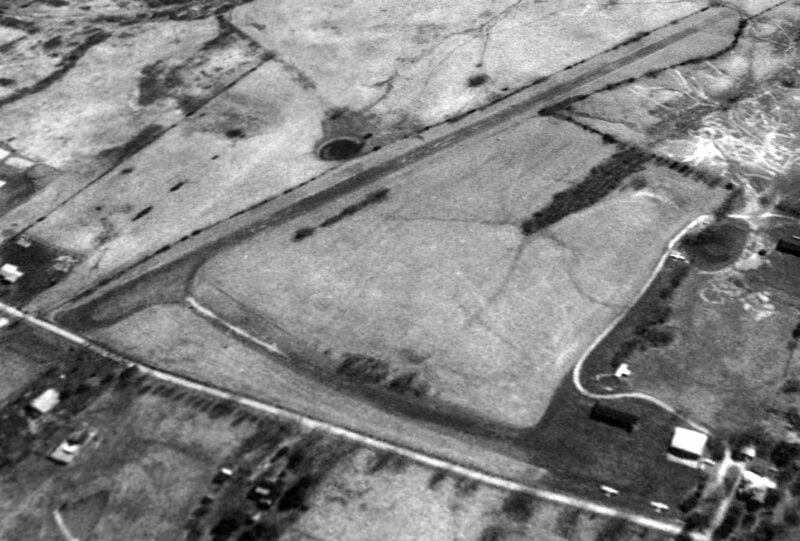 The earliest photo which has been located of Lackey Airport was a 1965 aerial view. It depicted a single northeast/southwest unpaved runway, with 1 light single-engine aircraft parked near 5 small hangarss on the northwest side. 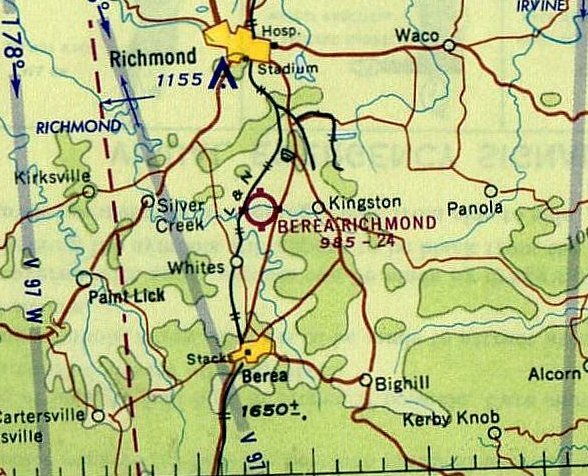 Lackey Airport was evidently renamed Berea-Richmond Airport, as that is how it was depicted on the 1965 Nashville Sectional Chart. Eric Karnes recalled, “Lackey Field was located on Menelaus Road (KY-2880) west of US-25 between Berea & Richmond. I went there frequently on weekends in the 1970s when a friend operated a skydiving club there. Miller Lackey & his father before him operated the airport. It was depicted as having a a single northeast/southwest unpaved runway, with a taxiway leading to 5 small buildings on the northwest side. 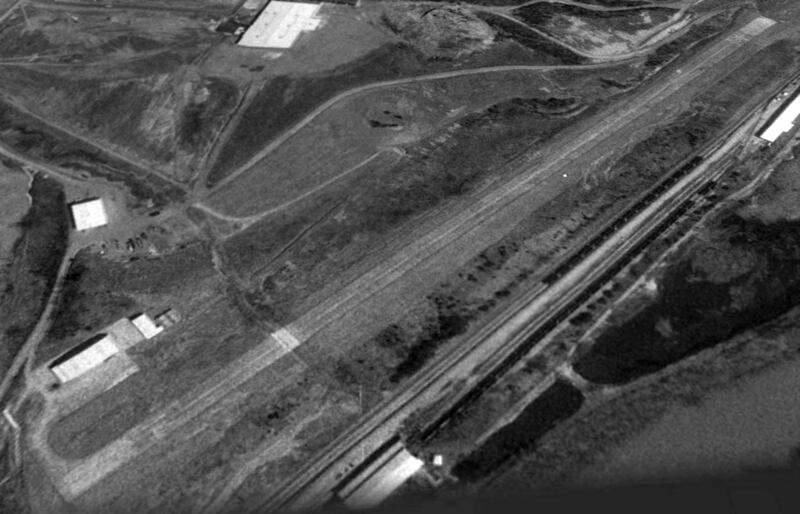 The last photo which has been located showing Berea-Richmond Airport in operation was a 1997 USGS aerial view looking southeast. Three light single-engine planes were parked near the hangars on the northeast side (bottom-right). Bearea-Richmond Airport has met the fate of so many other nice grassroots airports: a 2017 aerial view looking southeast shows it had been closed at some point between 1997-2017. The individual T-hangars had been removed, but the grass runway remained. The site of Berea-Richmond Airport is located southwest of the intersection of Menelaus Road & Raven Drive. 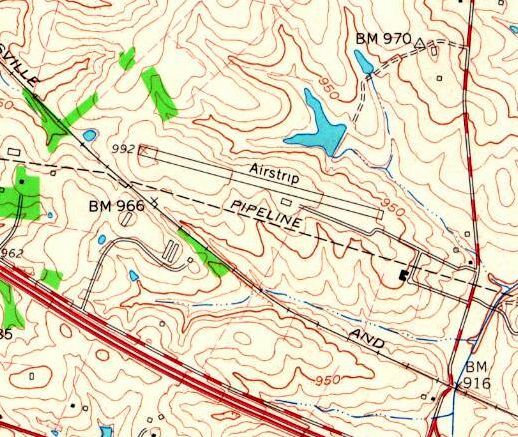 Irvine Airfield was labeled as a “Landing Strip” on the 1978 USGS topo map. 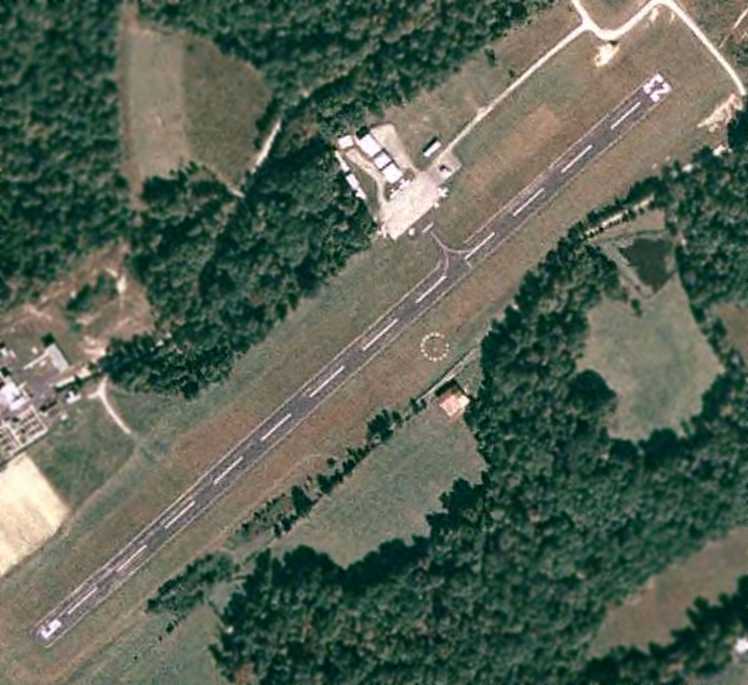 Not much is known about this presumed private airfield, including its name or purpose. nor on the January 1966 Nashville Sectional Chart (courtesy of David Stevenson). which depicted a single northwest/southeast runway labeled simply as “Landing Strip”. 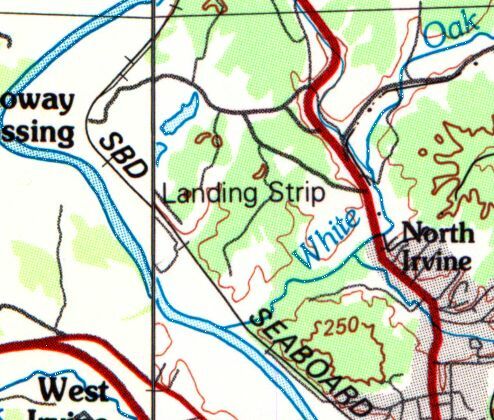 The 1982 USGS topo map continued to depict Irvine as a single northwest/southeast runway labeled simply as “Landing Strip”. 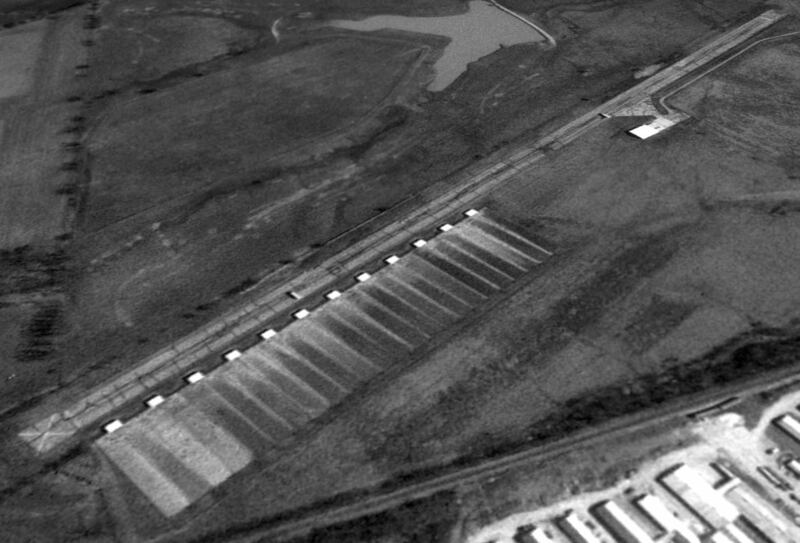 The earliest photo which has been located of Irvine Airfield was a 1995 USGS aerial view looking east. It depicted Irvine as having a single paved Runway 14/28, with a ramp & hangar on the north end. The last photo which has been located showing Irvine Airfield remaining intact was a 2013 aerial view looking east. A 2014 aerial view looking east showed Irvine Airfield considerably deteriorated in only a year. The 2015 Sectional Chart depicted Irvine as an abandoned airfield. The site of Irvine Airfield is located at the western terminus of Route 1840. Codell Field, as depicted on the 1956 USGS topo map. The date of establishment of this small airfield has not been determined. with 1 small building on the south side. was on the January 1966 Nashville Sectional Chart (courtesy of David Stevenson). It depicted Coddell as a private field having a 3,000' paved runway. 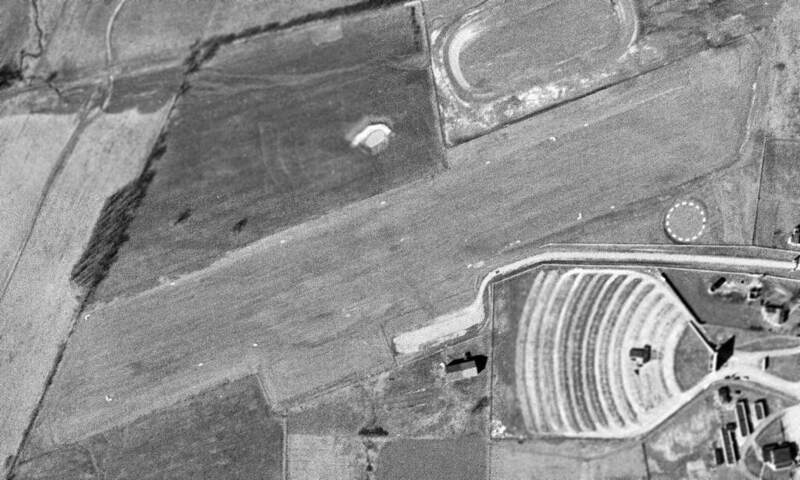 The earliest photo which has been located of Codell Field was a 1997 USGS aerial view looking northeast. 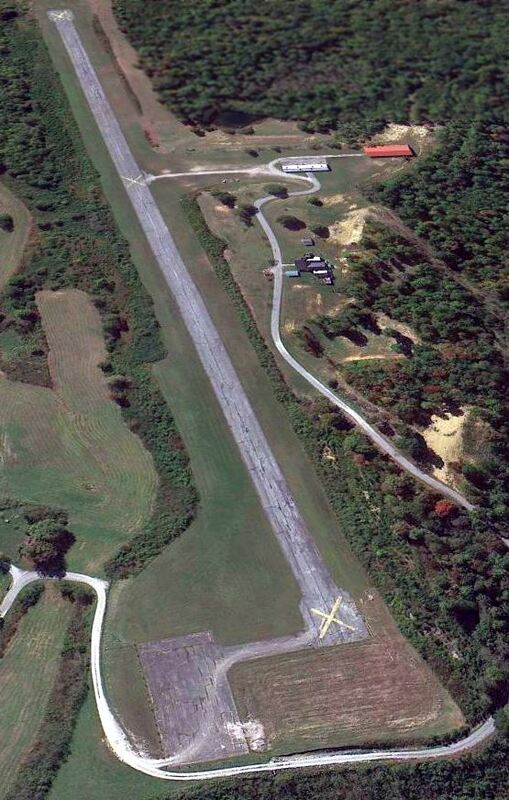 It depicted Codell as having a single paved runway, which was deteriorated & had closed-runway “X” symbols at each end. A single hangar was located south of the runway. A series of smaller buildings adjacent to the southeast side of the runway were presumably farm-related & not airfield-related. A 2014 aerial view looking northeast showed the Codell Field paved runway & hangar remained intact. According to Jacob McHone, this airfield may also have been known as Histle Field. Hangars are still there but last time I was there the drive is now a private drive & the airfield is now a farm. The hangars are used as stalls; the runway looks in good shape still. The site of Codell Field is located northwest of the intersection of Van Metre Drive & Rockwell Drive. Thanks to Jacob McHone for pointing out this airfield. The original Marshall Field, as depicted on a 3/1/52 USGS aerial photo. The original airport for the town of Georgetown was located on the south side of town. as it was not yet listed among active airfields in the 1945 AAF Airport Directory (courtesy of Scott Murdock). which depicted a very well-defined northeast/southwest grass runway, with a parking area & airport circle marking on the south side side. There were no hangars on aircraft visible on the field. probably a little too close for comfort. Eric Karnes recalled, “The original Marshall Field... was a short but busy little airport. 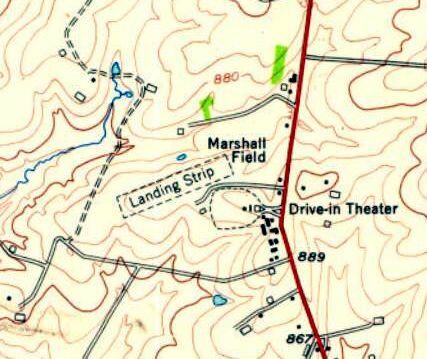 The 1954 USGS topo map depicted Marshall Field as having an unpaved northeast/southwest runway, with a drive-in theater adjacent to the south side. with a total of 16 light single-engine aircraft on the parking area on the south side of the runway. with a total of 22 light single-engine aircraft completely filling the available parking area on the south side of the runway. The last topo map depiction which has been located of the original Marshall Field was on the 1993 USGS topo map. Georgetown-Scott County Airport opened in 1993, at which point the original Marshall Field was closed. A 1994 aerial view showed the original Marshall Field remained intact, but devoid of any aircraft. A 1997 aerial view showed several baseball diamonds had been constructed over the site of the original Marshall Field. but the alignment of the former runway is still recognizable. The site of the original Marshall Field is located at the western terminus of Airport Road, appropriately enough. 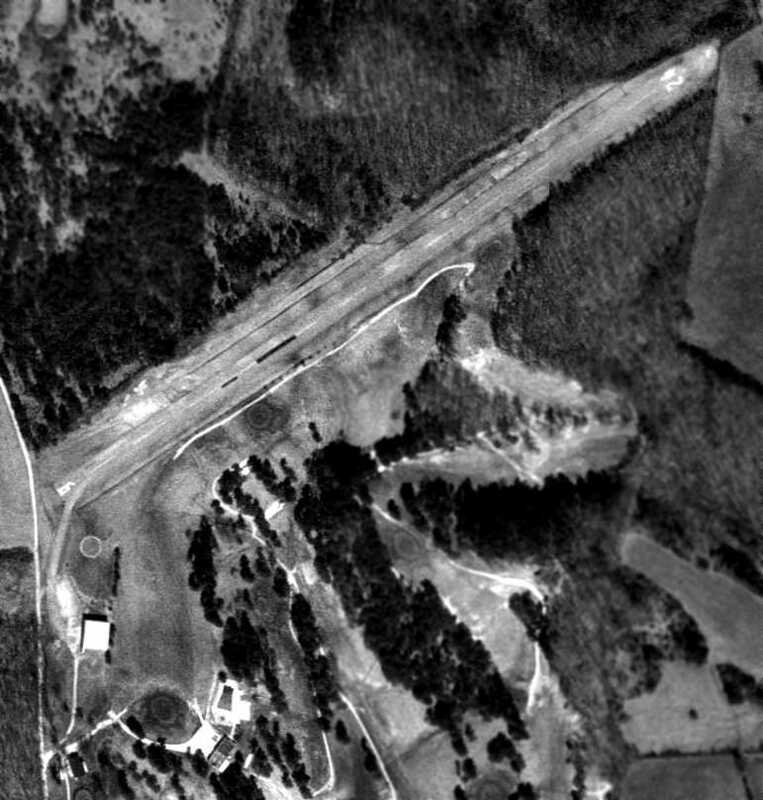 Olive Hill Airport, as depicted on a 3/29/61 USGS aerial photo. According to its FAA Airport/Facility Directory data (courtesy of Richard Finley), Olive Hill Airport was activated on 11/1/60. 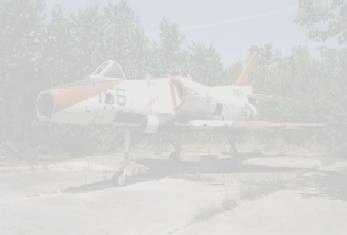 which depicted it as having an unpaved northeast/southwest runway, with a hangar along the west side. 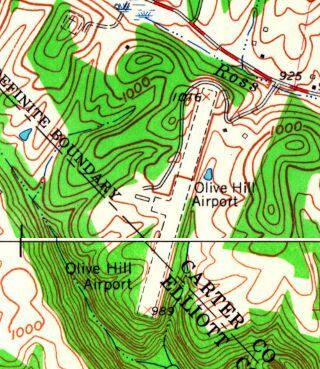 The 1962 USGS topo map depicted Olive Hill Airport as having an unpaved northeast/southwest runway, with a hangar along the west side. onto which one aircraft appeared to be entering at mid-field. an aviation pioneer & the first person to fly an airplane in Kentucky. 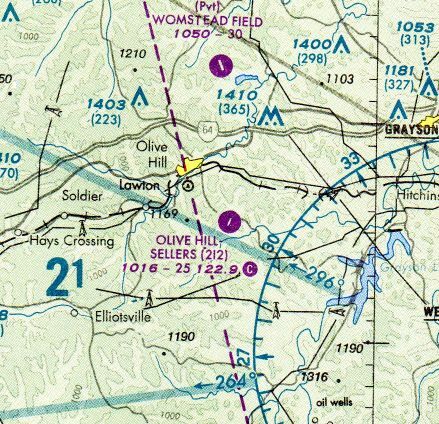 The July 1999 Cincinnati Sectional Chart (courtesy of Richard Finley) depicted Olive Hill Sellers as having a 2,500' runway. A 12/12/07 aerial view looking southwest showed Olive Hill's runway still marked as an active runway. the town of Olive Hill suffered from severe flooding in May 2010, which put a great economic stress on the community. 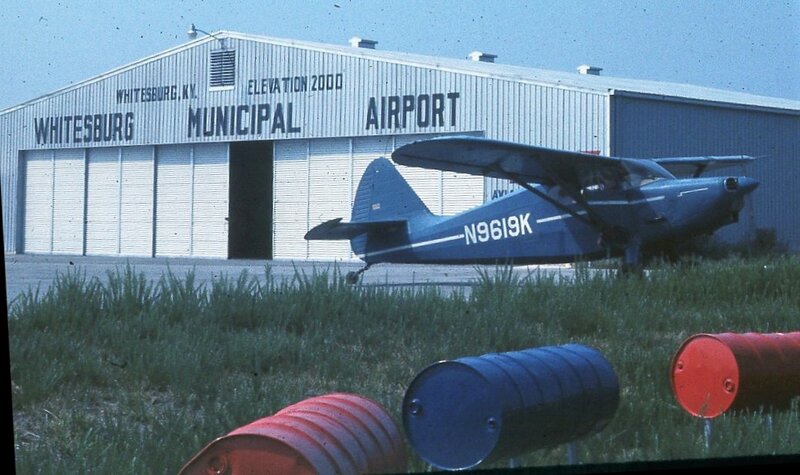 Olive Hill Airport had a 2,900' runway, parking ramp and fueling facilities. It serviced the construction industry, Carter Cave State Park visitors, business people and others. But due to issues over lack of maintenance, the state closed it in early 2010. A 6/20/10 aerial photo showed Olive Hill's runway marked with closed-runway “X” symbols. for a 12-month period ending 9/27/10 Olive Hill Airport conducted 50 takeoffs or landings & had 3 single-engine aircraft based at the airport. Olive Hill Airport consisted of 31 acres, with a 2,500' asphalt Runway 2/20. However, “Mayor Danny Sparks, who originally had recommended the sale, said Tuesday that he was wrong about the airport’s value to the city. He then asked the Council members to reverse their earlier decision. They did so, 5-0. 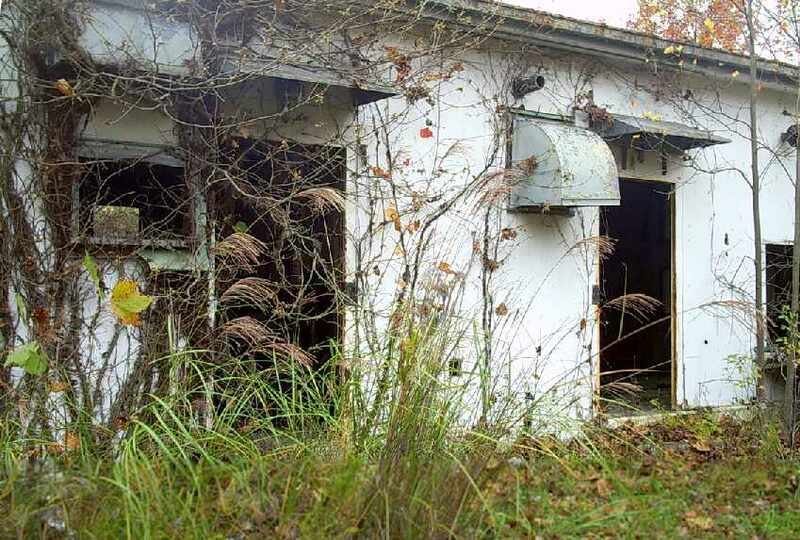 State Sen. Robin Webb described the property as a “jewel” that the city should retain. but the airport otherwise remained intact. 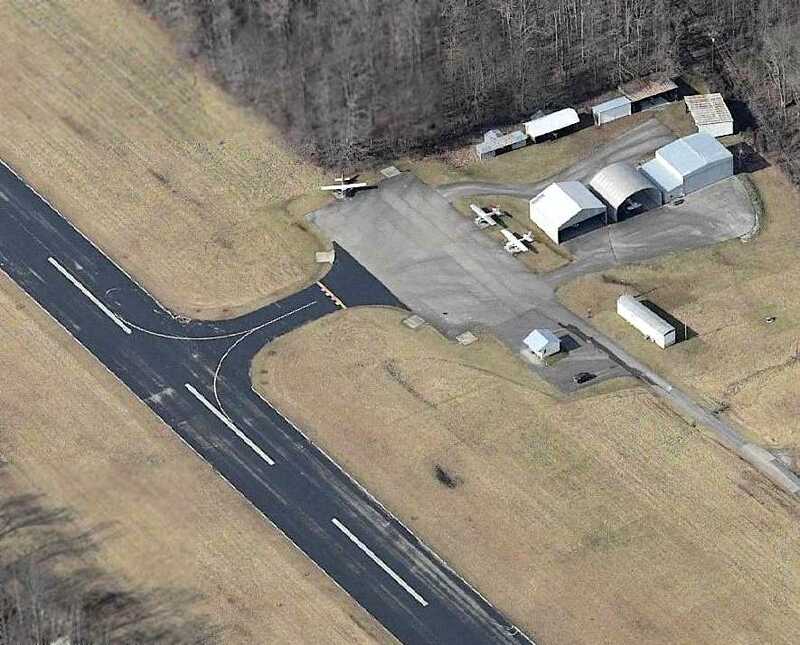 Olive Hill Airport is located southeast of the intersection of Ben's Run Road & Airport Drive. 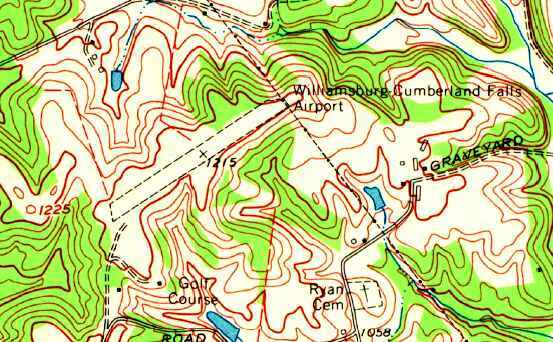 Hazard Airport, as depicted on the 1954 USGS topo map. Hazard Airport was established sometime on or before 1947. 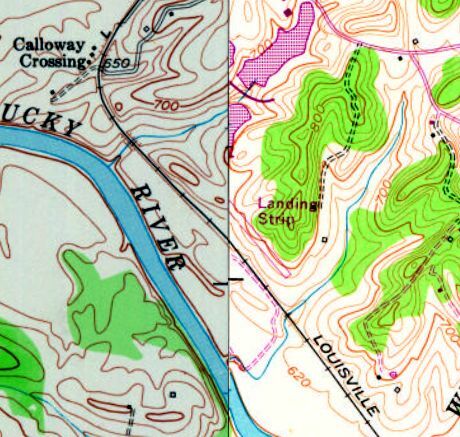 However, Hazard Airport was not yet depicted on the 1949 USGS topo map. which depicted it as a northwest/southeast clearing along the east bank of the Kentucky River. the same Hazard fictionally represented on the Dukes of Hazard TV show. This airport was down in a deep valley surrounded by some good-sized mountains. My ex-father-in-law owned a home close to the top of one of the overlooking mountains. Jim recalled, “The old Hazard Airport... I learned to fly there & was in the Civil Air Patrol. Taoist recalled, “I lived in Hazard from 1958-62. My mother was a laboratory technician in the old Miners Memorial Hospital during that time. There was a doctor at the hospital that was my hero & he used to fly for pleasure out of the Hazard Airport. His name was Dr. Bill Leonard, and he had a old Stinson Voyager & we would go up every couple of months. On a few occasions he even let me fly the Stinson as well as a Piper J2 Cub that he used to fly occasionally. I don't think the Piper was his but belonged to a flying club at the airport. We got to the airport by parking his car next to Highway 15 & walking across a swinging bridge over the river. The airport runway was completely grass with very few buildings on site. 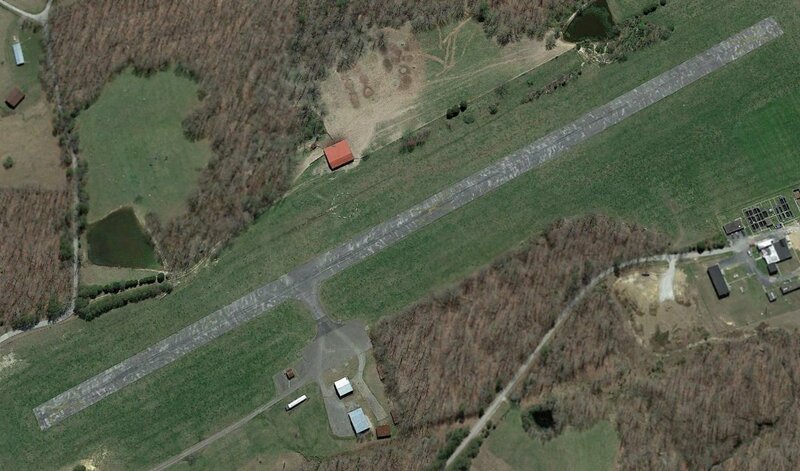 as having a single 2,300' paved Runway 17/35, with a few small buildings on the west & east sides. Divadawg recalled, “I can remember landing at the old Hazard Airport in the summer of 1968. Several members of Hazard's yearbook staff had gone to Athens, Ohio, for training & we had to fly home because of problems with land transportation. That was the first & last flight I ever made into that airport & boy was it exciting! 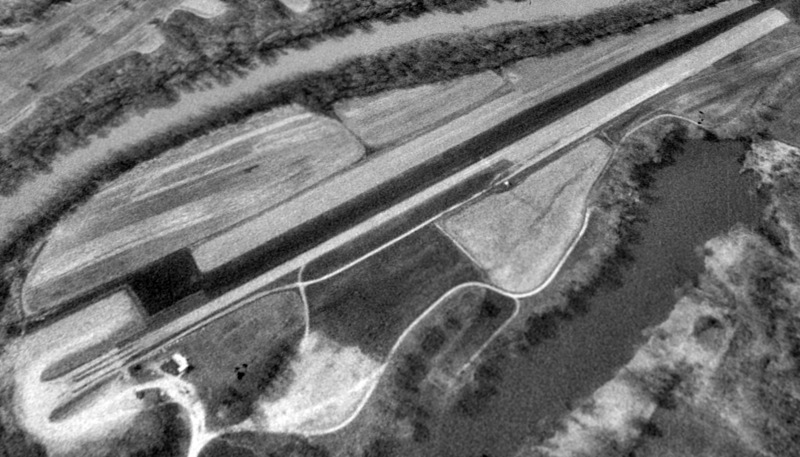 The earliest photo which has been located of the Hazard Airport was a 4/10/71 USGS aerial photo. It depicted Hazard as having a single paved northwest/southeast runway. and a cluster of small hangars was on the northeast side. as having a single paved northwest/southeast runway. showed a single paved runway, with taxiways leading to a ramp with several buildings & 8 single-engine aircraft. showed what appeared to be several light aircraft on the ramp. Roger Dearnaley recalled, “When I was in high school in the 1970s, I worked at Kentucky Flying Service at Bowman Field. The charter pilots often had to fly to Hazard, and told many stories about close calls there. 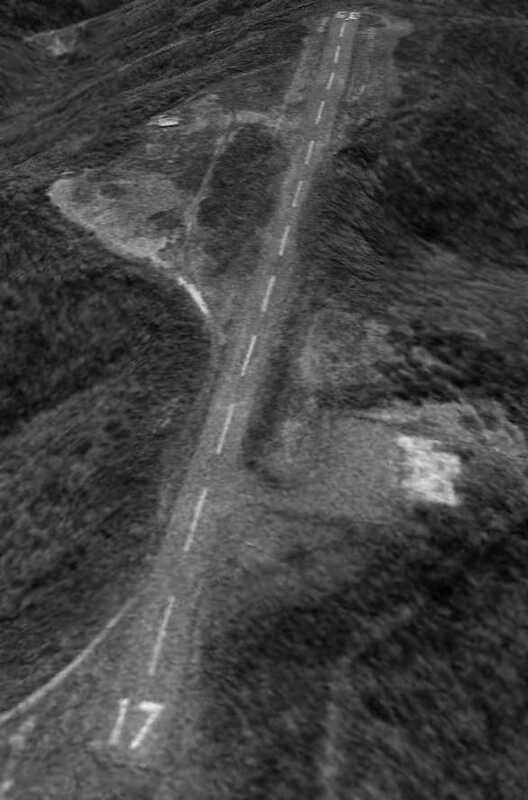 The last photo which has been located of the Hazard Airport was a 3/4/77 USGS aerial photo. 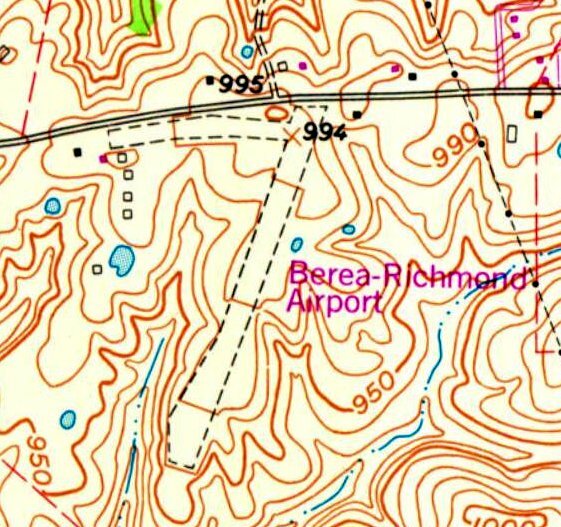 The 1979 USGS topo map still depicted the Hazard Airport. Tim recalled, “I remember the day Tom Wopat of The Dukes of Hazard landed there. Mikey Bowling recalled, “I used to hang out there a lot with my dad. He had a couple of business planes there for his company. Alice Noble would take me in some of the planes & taxi me down the runway. actor Tom Wopat of television's “The Dukes of Hazard” flew into Hazard Airport to present a check to a local charity. 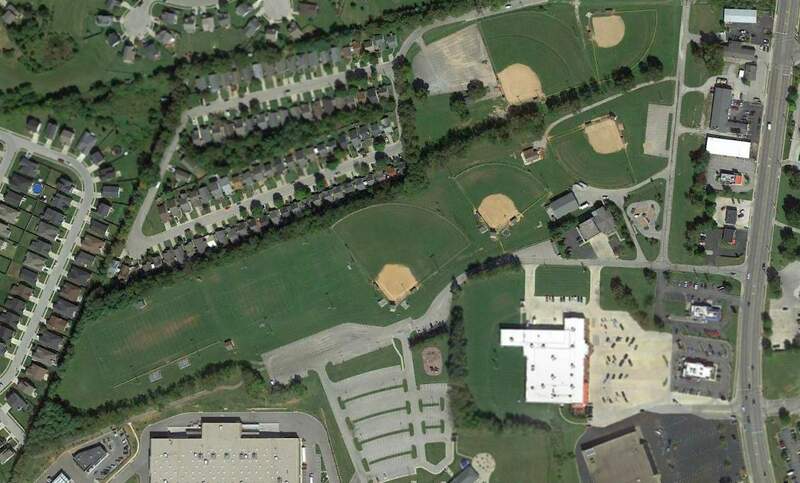 and depicted the Perry County Central High School on the northern portion. 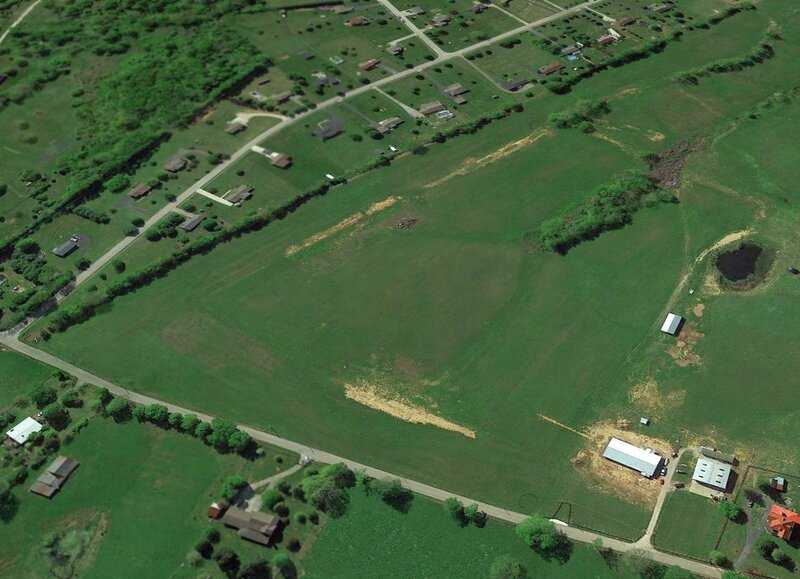 A 6/20/10 aerial photo did not show any remaining trace of Hazard Airport. The site of Hazard Airport is located northeast of the intersection of Park Avenue & Perry Park Road. Thanks to Allen McDavitt for pointing out this airfield. 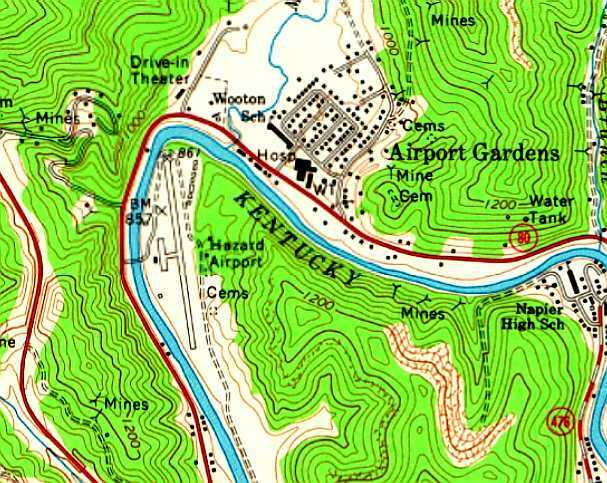 The Williamsburg Cumberland Falls Airport, as depicted on the 1965 USGS topo map. as it was not yet depicted on the 1952 USGS topo map. 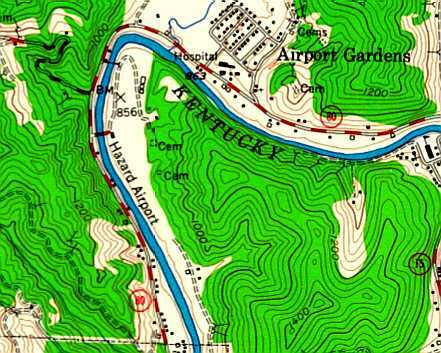 The earliest depiction which has been located of the Williamsburg Cumberland Falls Airport was on the 1965 USGS topo map. as having a single unpaved northeast/southwest runway. 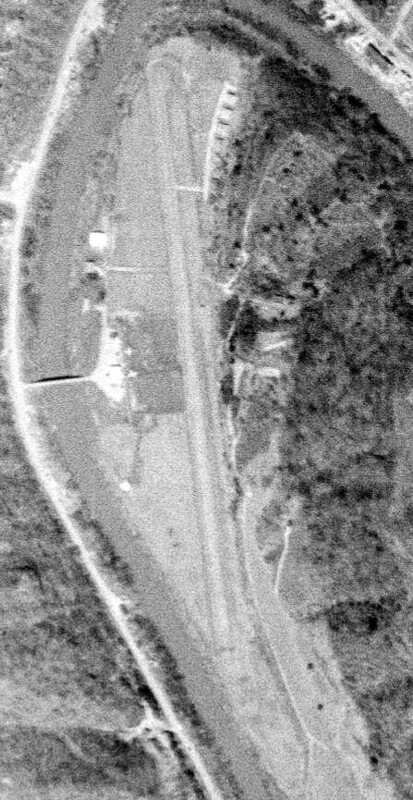 The earliest photo which has been located of the Williamsburg Cumberland Falls Airport was a 5/27/69 USGS aerial view. 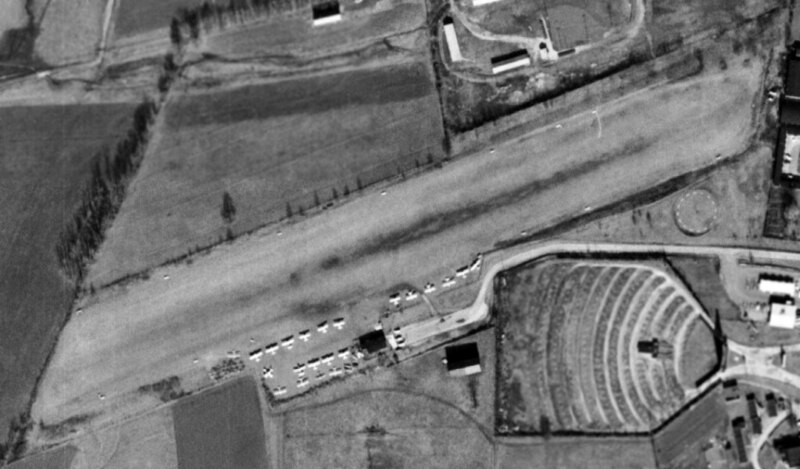 A single small building had evidently been added on the southwest side at some point between 1969-82.
as a 1997 USGS aerial view depicted the field as having a single paved Runway 6/24, with a single small hangar on the southwest side. There were no planes visible on the field. and the Williamsburg Cumberland Falls Airport was presumably closed at the same time. 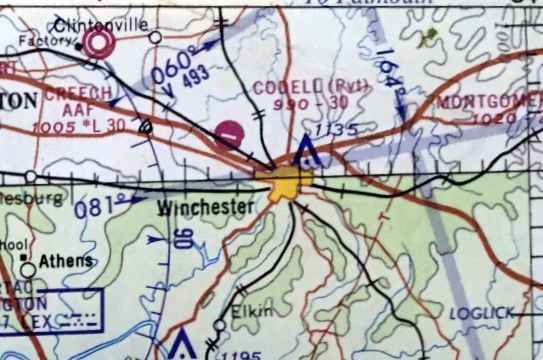 As of 2009 the Williamsburg Cumberland Falls Airport was no longer depicted on aeronautical charts. 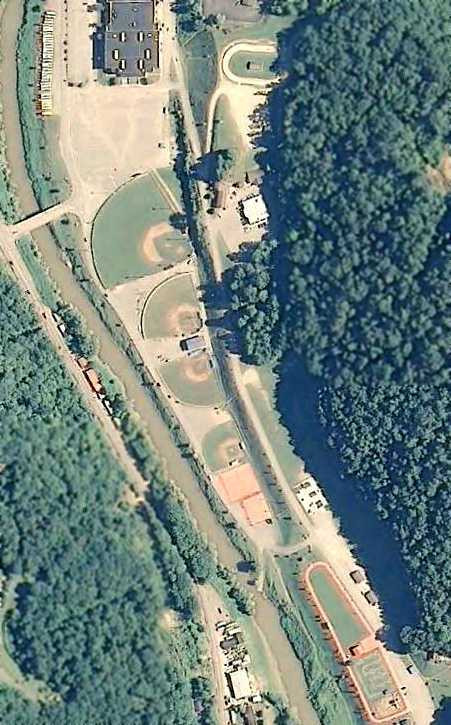 A 2015 aerial view looking north shows the Williamsburg Cumberland Falls Airport remained intact. 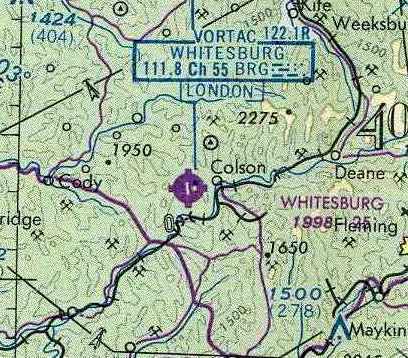 The site of the Williamsburg Cumberland Falls Airport is located northeast of the intersection of Pilot Drive & Airport Road, appropriately enough. 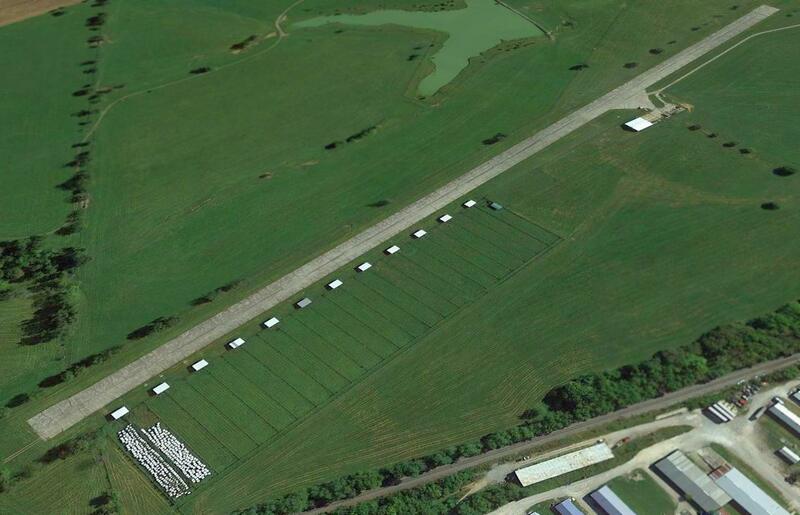 Thanks to Aaron Renfro for pointing out this airfield. Morehead Rowan County Airport, as depicted on the February 1964 Huntington Sectional Chart (courtesy of Chris Kennedy). nor on the January 1963 Huntington Sectional Chart (according to Chris Kennedy). was on the February 1964 Huntington Sectional Chart (courtesy of Chris Kennedy). depicted the field as having a single 2,600' paved runway. 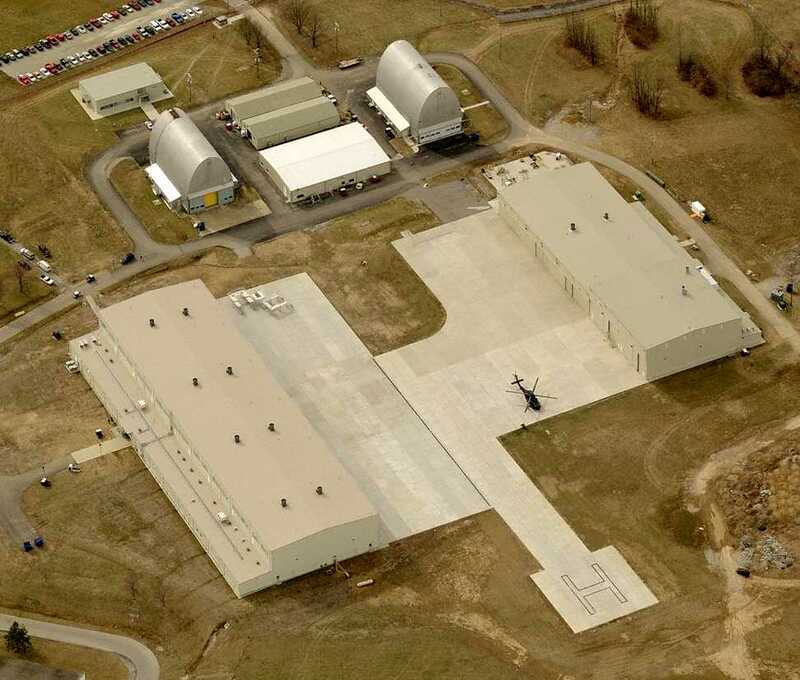 as having a single paved 2,600' Runway 5/23, with a ramp & 2 small buildings on the north side. with a ramp with a single hangar on the north side. around which were several small hangars. Note another T-hangar next to the filtration plant adjacent to the southwest side of the airport. at which point the original Morehead-Rowan County Airport presumably was closed. 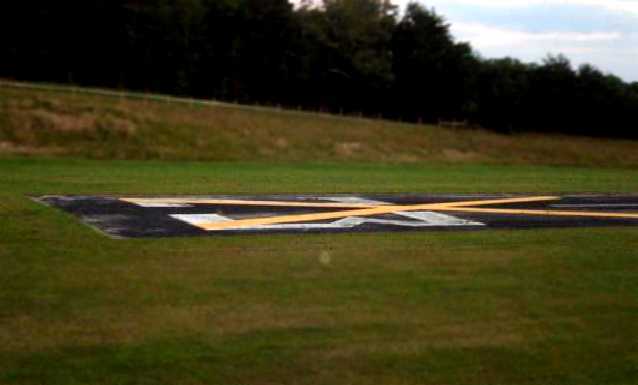 as a 2008 photo by Nicki Sloan-Petronella showed large closed-runway “X” symbols painted over the runway. 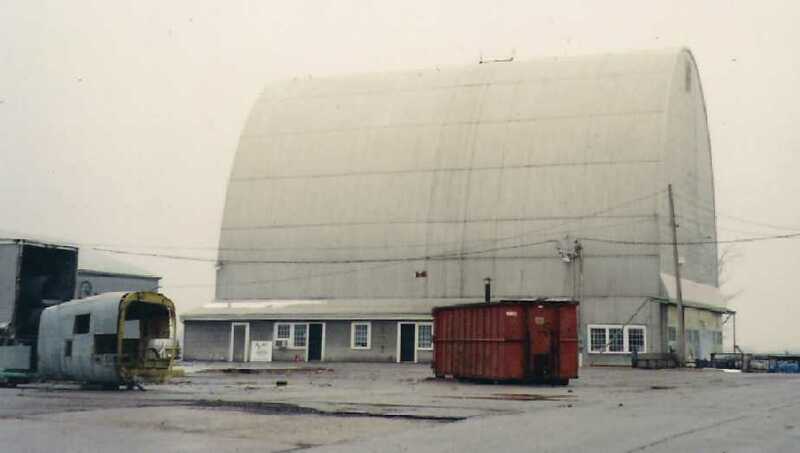 showing the former office & one hangar (the other hangars have presumably been removed). Nicki noted, “Notice the hangar is full of hay, now! I wish I could have gotten closer, but there is a gate blocking the drive. Makes me so sad! The is the runway where I had my first airplane ride as a child and later, my first lesson. 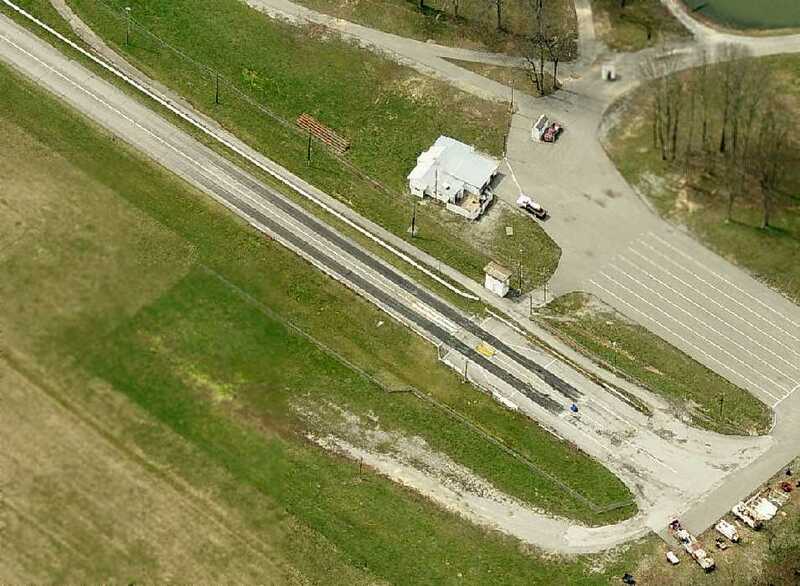 A 2016 aerial view looking southeast showed the former Rowan County Airport remains intact. The site of the Rowan County Airport is located southwest of the intersection of C Thompson Road & Airport Road, appropriately enough. 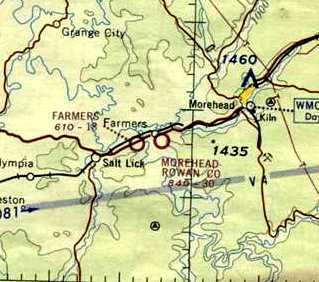 The Whitesburg Airport, as depicted on the March 1966 Winston-Salem Sectional Chart (courtesy of Chris Kennedy). 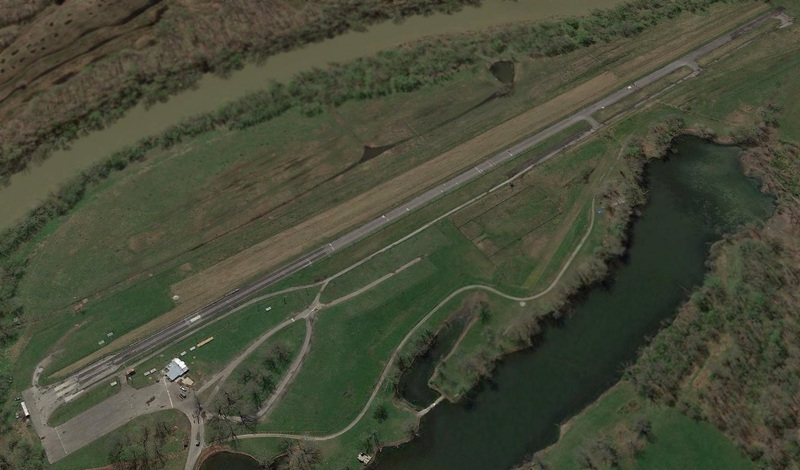 According to Mark Collins, this small general aviation airport also may have been known as Isom Airport. as it was not yet depicted on the April 1964 Winston-Salem Sectional Chart (according to Chris Kennedy). along with a VOR navigational beacon. this one showing his 1947 Stinson Voyager in front of the Whitesburg hangar. Linc Reed-Nickerson recalled, “I planned Bluefield, WV but the fog hadn't lifted & another pilot on the FSS frequency suggested Whitesburg. after a low pass to check for up- or down-drafts I came around again, and still wasn't quite comfortable, but on my 3rd approach I nailed it. which made me the subject of some good-natured criticism, I purchased fuel, joined the boys for a soda & met Maynard Hogg, my goodness, right out of the Dukes of Hazard. 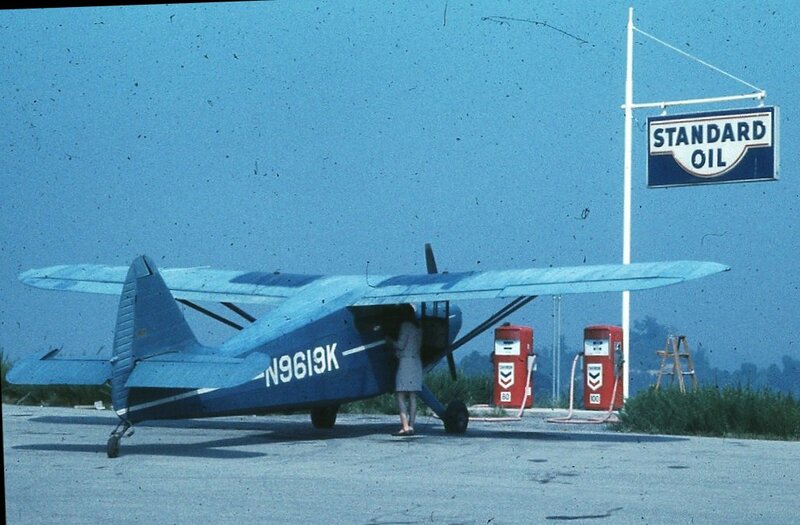 An 8/29/69 photo by Linc Reed-Nickerson of his wife Peg with their 1947 Stinson Voyager in front of the Whitesburg gas pumps. 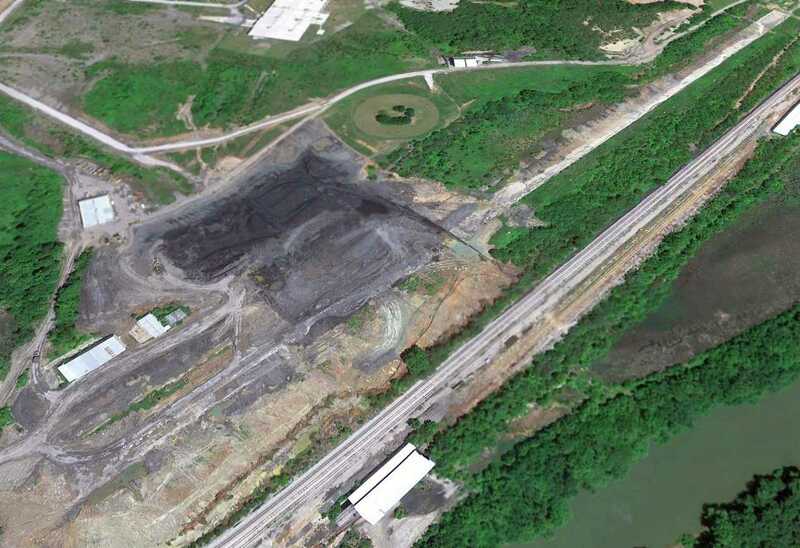 James Wright recalled, “The Whitesburg Airport was built on the leveled-off top of a hill which had been strip-mined for coal. and landed there to escape lowering conditions & high winds. At that time, it was operational, but unattended. and had heard me circling, so he drove up the steep road in a 4-wheel drive vehicle & took me into Whitesburg to a hotel. was on the August 1976 Cincinnati Sectional Chart (courtesy of Chris Kennedy). 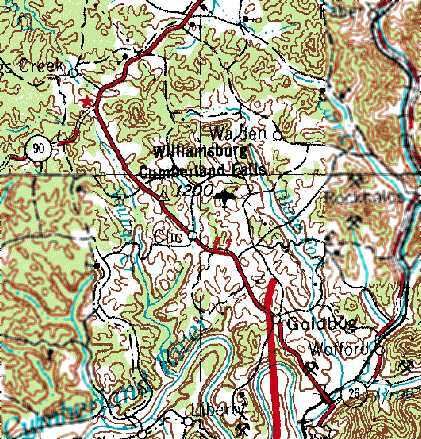 It depicted Whitesburg as having a single 2,500' paved north/south runway. at some point between 1966-66 to a VORTAC (combination VOR & TACAN beacon). 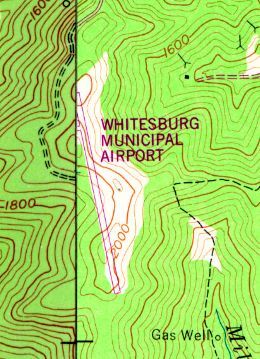 The 1978 USGS topo map depicted “Whitesburg Municipal Airport” as having a single paved runway. with a paved ramp & a single small building on the west side of the field. was still marked as an active runway (without any closed-runway symbols). The former building on the ramp on the west side of the field appeared to have been removed. remained in the clearing on the east side of the strip. 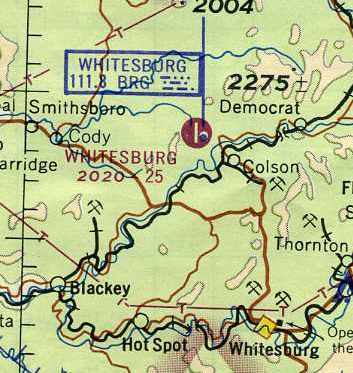 the Whitesburg Airport was closed at some point between 1960-2000.
were depicted at all on the December 2003 Cincinnati Sectional Chart (according to Chris Kennedy). Mark Collins reported in 2005, “The landing strip is still there but is in rough shape. 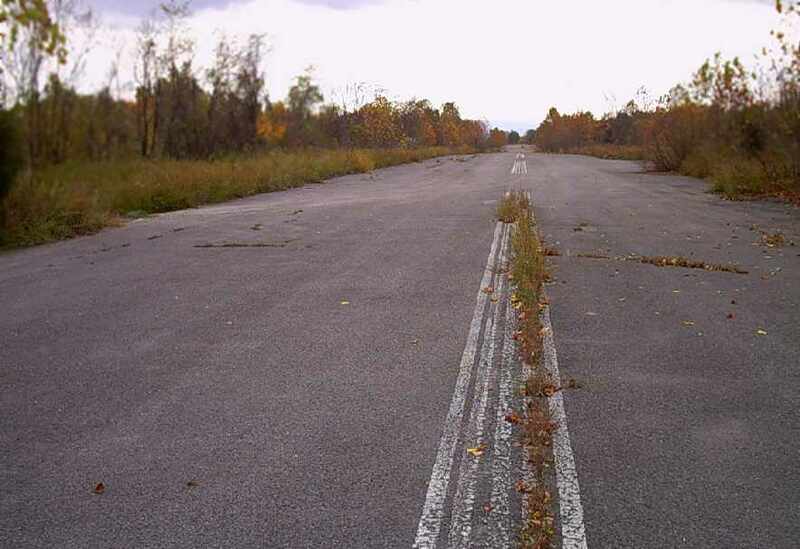 An October 2006 photo by Mark Collins of the abandoned runway at the site of the Whitesburg Airport. An October 2006 photo by Mark Collins of the building which remains standing at the site of the Whitesburg Airport. 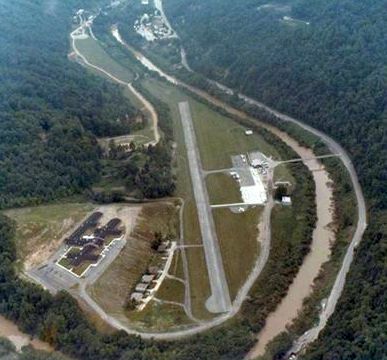 A 2007 photo by Brian Thompson looking northwest from a Cessna 180 at the Whitesburg Airport. 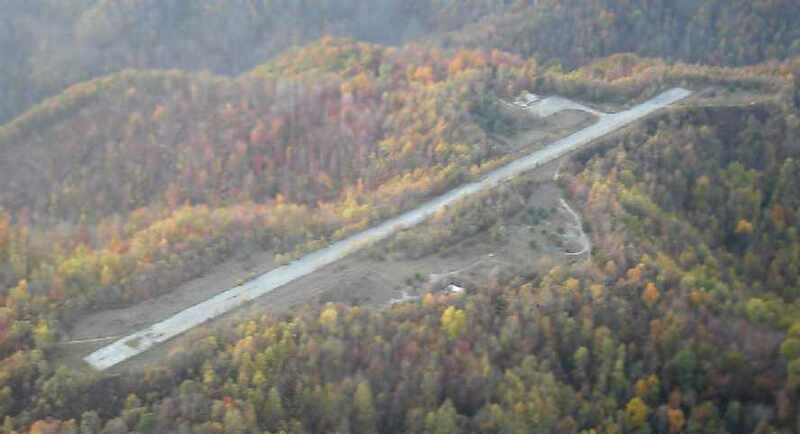 A circa 2006-2010 aerial view looking north at the remains of Whitesburg Airport. 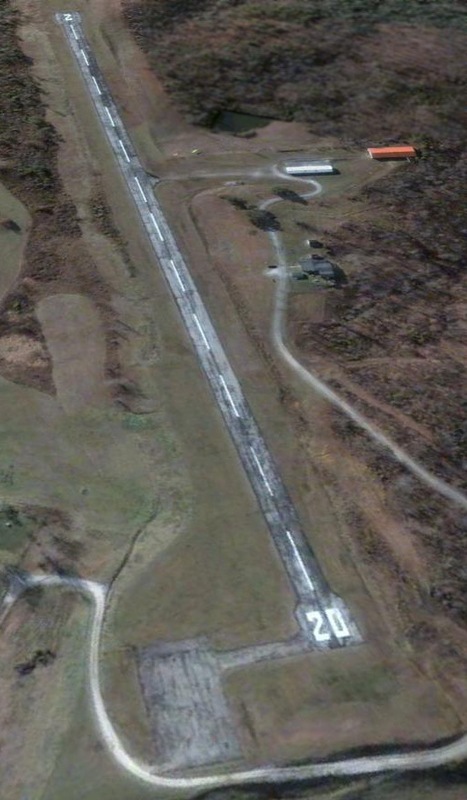 A 6/21/10 aerial view looking southeast showed that Whitesburg's Runway 17 markings were still barely recognizable. 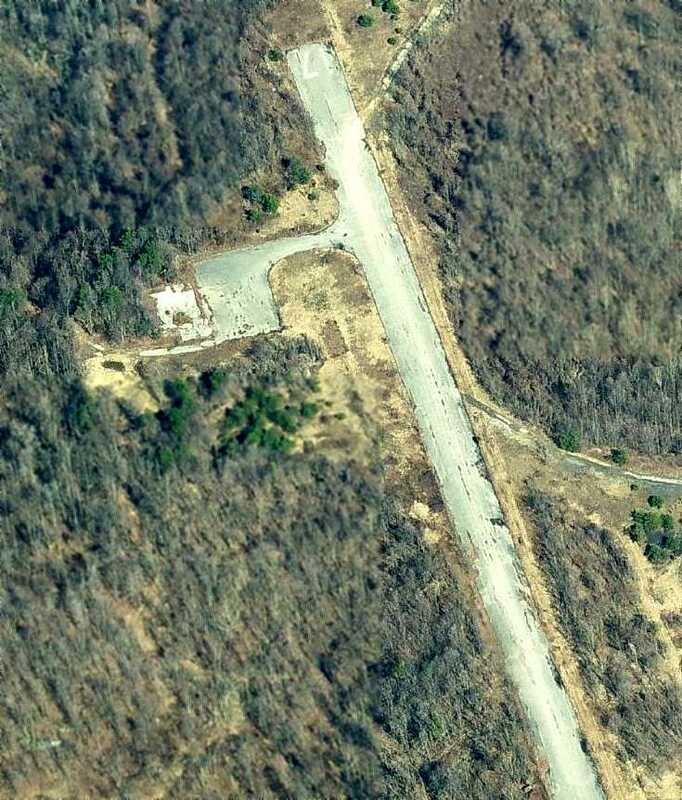 The site of the Whitesburg Airport is located at the southern terminus of Route 2547. 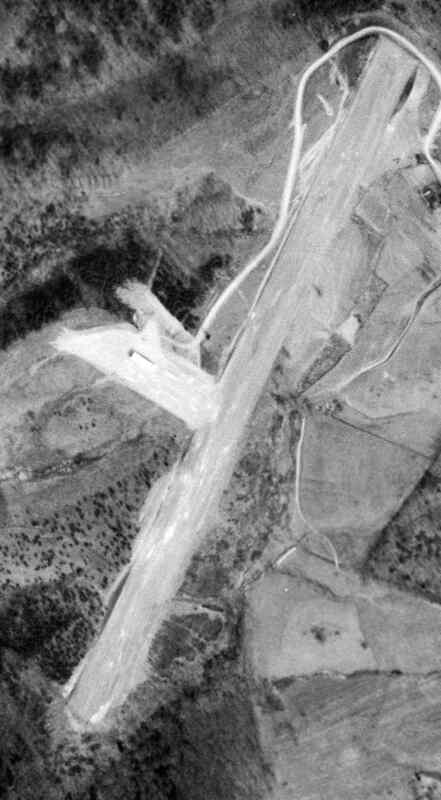 A 4/19/60 USGS aerial photo appeared to show the Thorn Hill Airfield when it was newly constructed. According to drag racing historian Bret Kepner, this airfield had a colorful history. he learned that "the airfield was built by alcohol bootleggers during Prohibition. 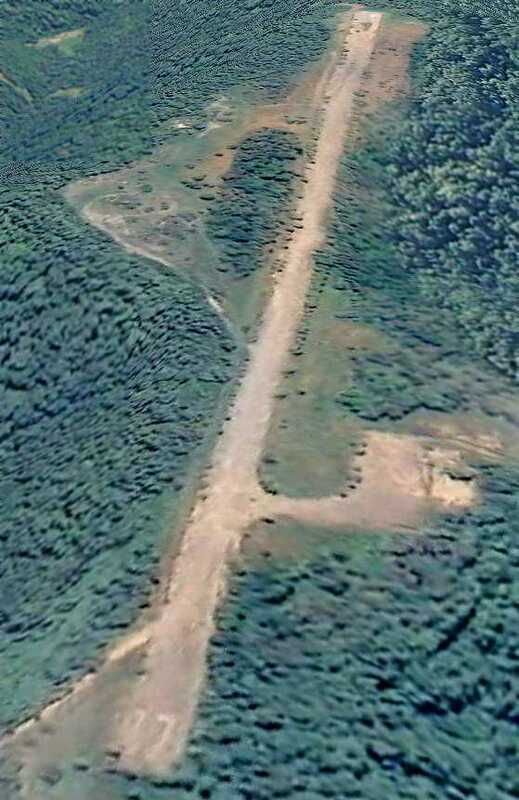 The airstrip was created deep in the woods where it was virtually undetectable from the ground. was smuggled on night flights to nearby Cincinnati, OH. resulting in a large number of arrests. whose mayor apparently assisted in the bust. 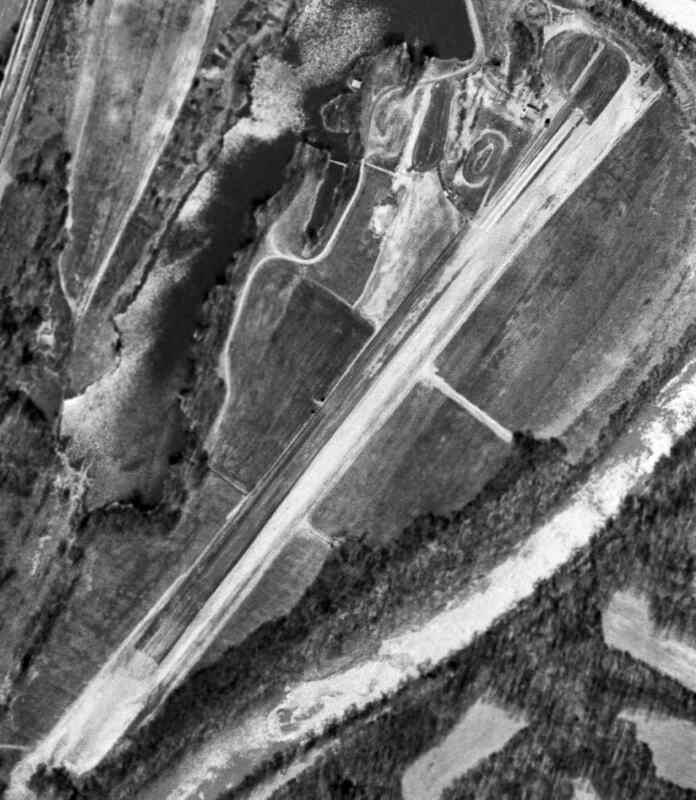 However 1949 & 1952 USGS aerial photos just showed a farm field, with no recognizable sign of an airfield. 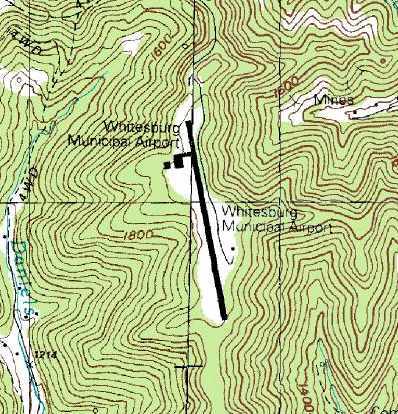 And no airfield was depicted at the site on the 1953 USGS topo map. resulted in the local arrest of a young street racer...the mayor's son! if it would keep his son's racing activities off the street. Thus was born Thorn Hill Drag Strip!" 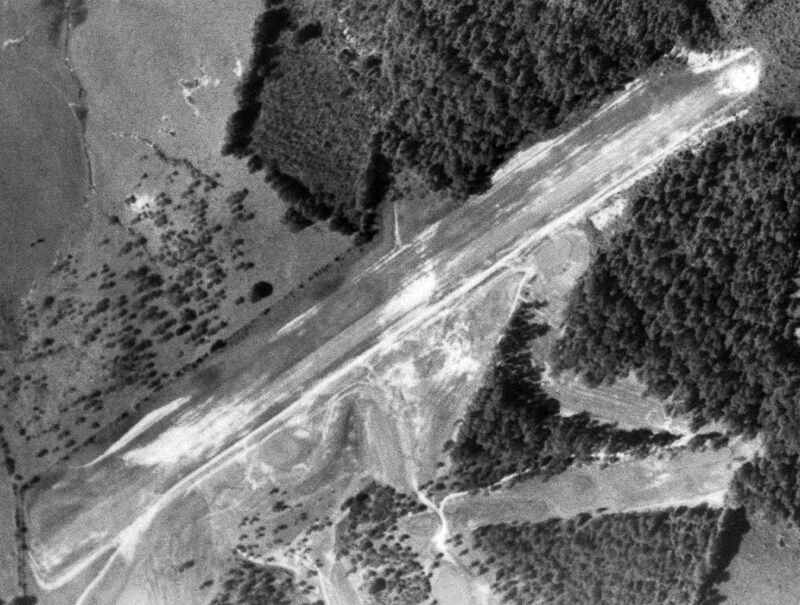 The earliest photo which has been located of the Thorn Hill Airfield was a 4/19/60 USGS aerial photo. with a single northeast/southwest runway. 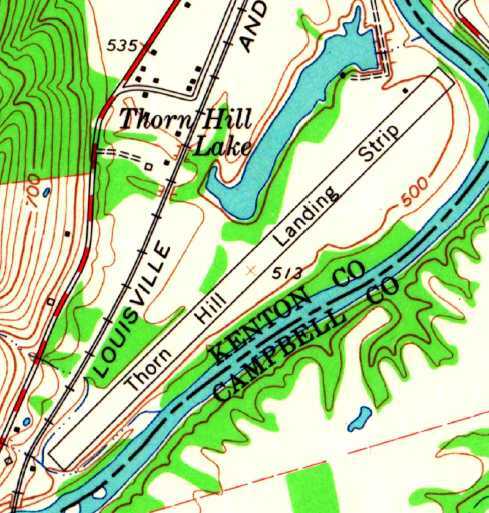 “Thorn Hill Landing Strip”, as depicted on the 1961 USGS topo map. It was not listed among active civil airfields in the 1962 AOPA Airport Directory. According to Steve Trutschel, “Ralf Payne owned & operated that property until his passing in the mid-1990s. and the guy lining up the cars at the starting line would hold them in place & motion me to land. I flew in & watched the races many Saturday evenings as Thornhill is only about 5 miles from the private airstrip where I live. and it was a dirt drag strip when he started racing there. Everyone would use snow tires for traction. He remembers how great it was the day Ralf blacktopped the first 100 or 150 feet of the strip for traction for them. When I was a kid in the mid-1960s there were at least 3 airplanes kept there. I ended up buying a worn-out 1946 Stinson 108-3, that ironically, was one of the 3 planes that used to be kept there. It is still very much country out there & I know of no ordinances that would prevent aircraft operations there. and I would pick them up because my strip is very short & a Cub is one of the few planes that can go in there. complete with all the Navy military markings. Ralf ALWAYS drove out & met you at the plane. I assume it was Ralfs wife with him as he met the T-34. "I don't know, this doesn't look like Kansas to me!" Steve continued, “I quit flying the Cub in there because I tore it down to restore it. Sadly Ralf passed away before it was finished & he never got to see it again. I know several people that still race there every Saturday in the summer. In this day & age there are more & more houses being built, and more & more complainers. Most of the complainers are on the other side of the river & that is a different county so it is complicated. But I enjoy the races & I can hear them at my house, It's just part of that area. I know several people that race there & one of them has even asked the new owner if I could fly in there again. 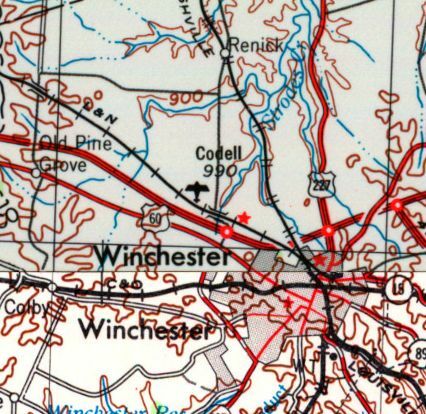 The earliest depiction which has been located of the Thorn Hill Airfield was on the 1961 USGS topo map. It depicted “Thorn Hill Landing Strip” as a single northeast/southwest runway, with a small building on the north side. 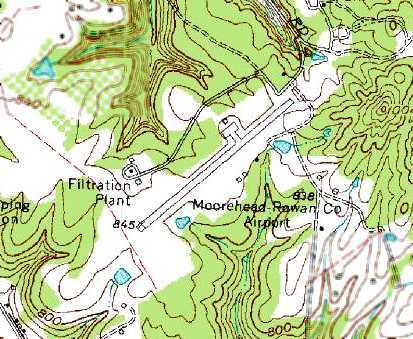 Thorn Hill was not listed among active civil airfields in the 1982 AOPA Airport Directory. 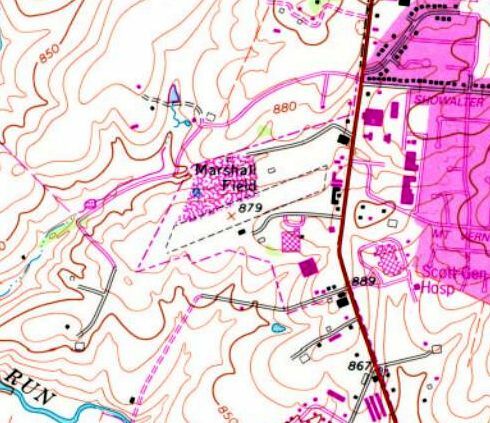 The 1983 USGS topo map depicted the single former runway but did not label it at all. 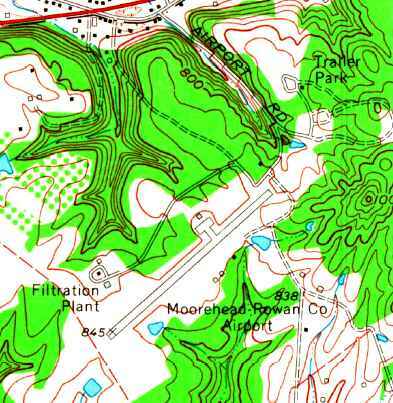 The former runway was labeled "drag strip" on the 1984 USGS topo map. A 1993 USGS aerial view looking south showed Thorn Hill to not show any sign of recent aviation use. The Thorn Hill property was also used until 2001 for flying radio controlled model aircraft, until that use was also precluded by zoning. 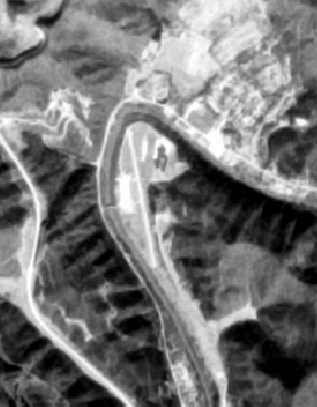 Thorn Hill was labeled "drag strip" on the 2002 Sectional Aeronautical Chart. and precludes him from renting tie-downs for aircraft. The 7/9/01 issue of the Cincinnati Enquirer reported that neighbors had been making complaints about the noise from drag racing at Thorn Hill. 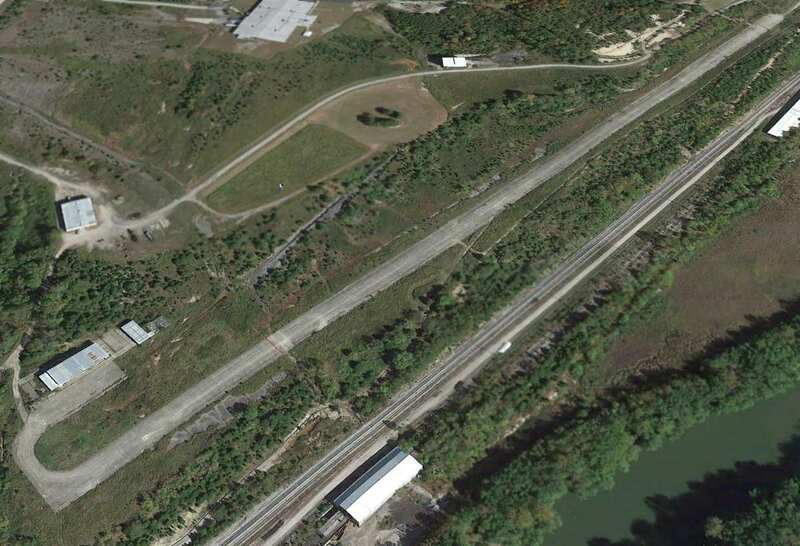 A circa 2006-2010 aerial view looking west at the north end of the former Thorn Hill runway, now reused as a drag strip. 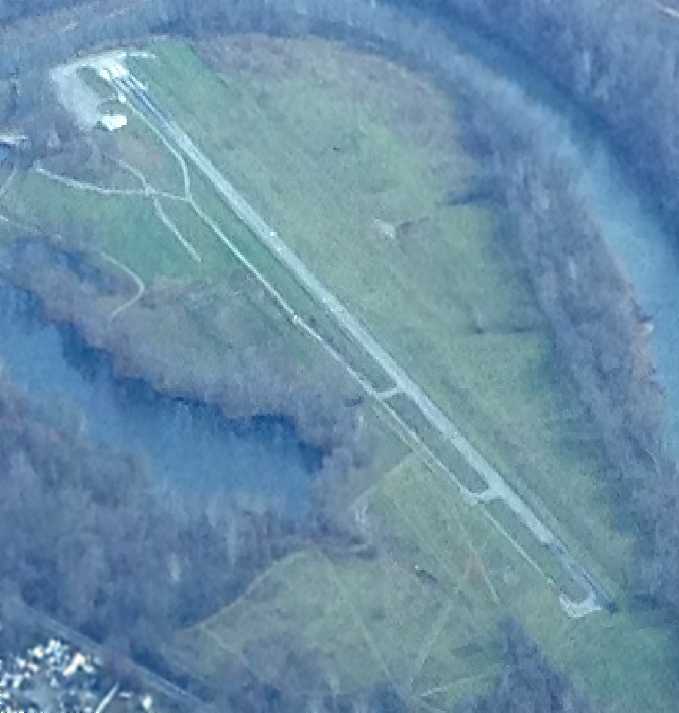 An 11/14/12 aerial view by Paul Freeman looking northeast at the former Thorn Hill runway. A 2017 aerial view looking south along the former Thorn Hill runway. a half mile southeast of the town of Kenton. Creech AAF, as depicted in the 1960 Jeppesen Airway Manual (courtesy of Chris Kennedy). was built early in WW2 to store, repair & issue the Signal Corps' communications & electronic equipment. 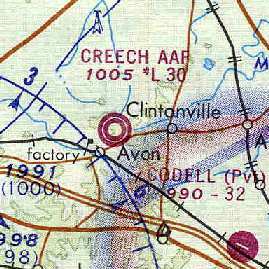 According to the 11/20/58 Lexington Herald (courtesy of Mark Hess), Creech Army Airfield was dedicated on 11/19/58. 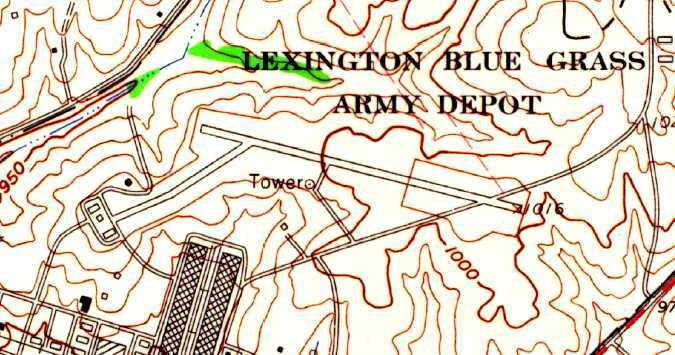 The airfield was built to support the activities of the Lexington Blue Grass Army Depot. was in the 1960 Jeppesen Airway Manual (courtesy of Chris Kennedy). with a taxiway leading to the southwest to a ramp with an operations building & several other buildings. A control tower was depicted south of the runway. A January 1960 photo (courtesy of Mark Hess) of a Bell H-13 helicopter being refitted with new UHF & FM radio equipment by a Lexington Signal Depot avionics crew. A March 1960 photo (courtesy of Mark Hess) of the Lexington Signal Depot's L-20 aircraft. 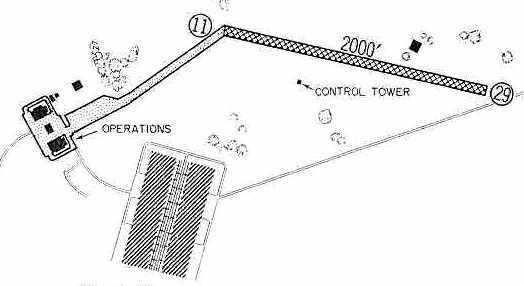 Creech AAF was described as having a 2,000' steel pierced planking runway & a control tower. with a taxiway connecting the runway to a ramp with two small hangars. A control tower was south of the runway. A total of 4 light fixed-wing aircraft were parked on the ramp. described Creech AAF as having a single 3,000' pierced steel planking runway. a tower, and a taxiway leading to a ramp with 3 buildings on the southwest side. depicted Creech AAF as having a 3,000' paved runway. 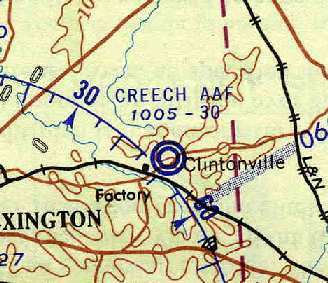 Creech AAF, as depicted on the 1970 Cincinnati Sectional Chart (courtesy of Chris Kennedy). depicting the existing runway & the (apparently planned but never built) crosswind runway. William Kempf recalled that in 1984 "I was stationed there & it had a nice set of runway lights & bumpy dirt runway." 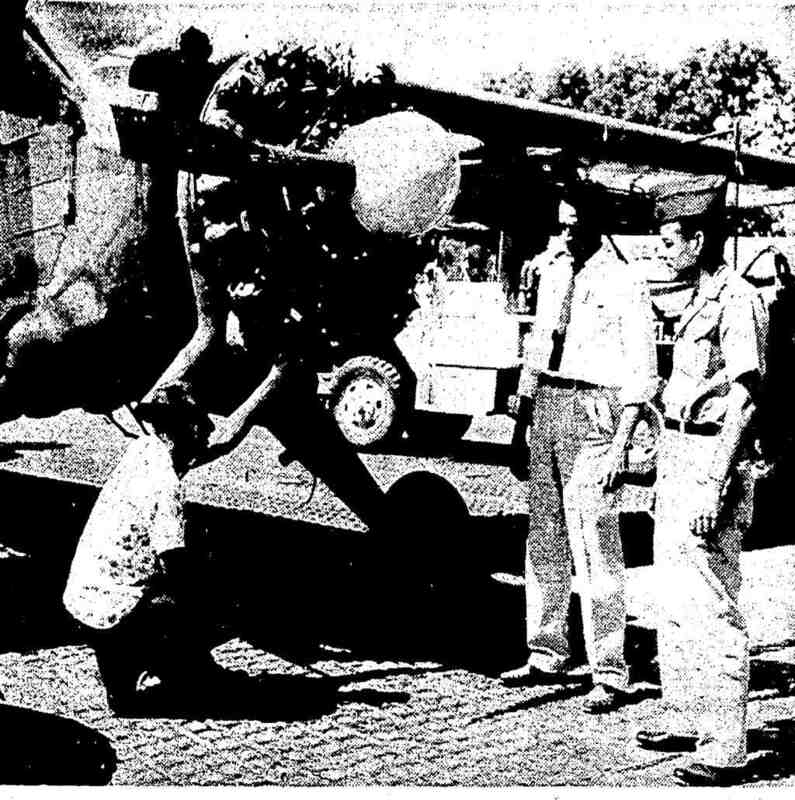 He recalled that the runway would have been usable for small single engine fixed wing aircraft. that seems to be on the map but is missing from the photo?" and was scheduled to be transferred to the Kentucky National Guard in 1994.
after the Lexington Blue Grass Army Depot's closing." and a taxiway connecting the runway to a ramp with two small hangars. 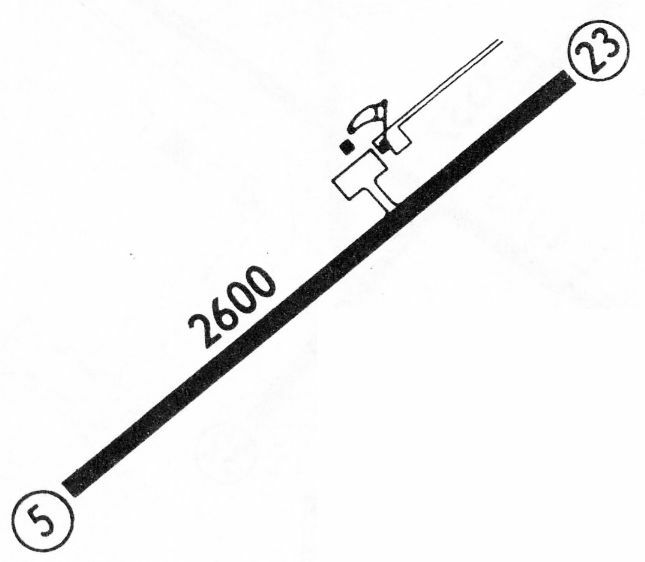 There was no sign of the control tower depicted on the 1960 diagram. and it appeared to have been used up to a later date than the runway. 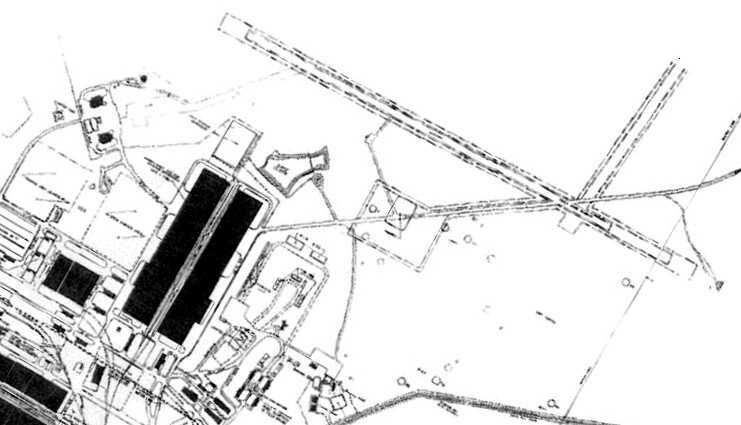 but it was depicted as an abandoned airfield on the 1998 World Aeronautical Chart. 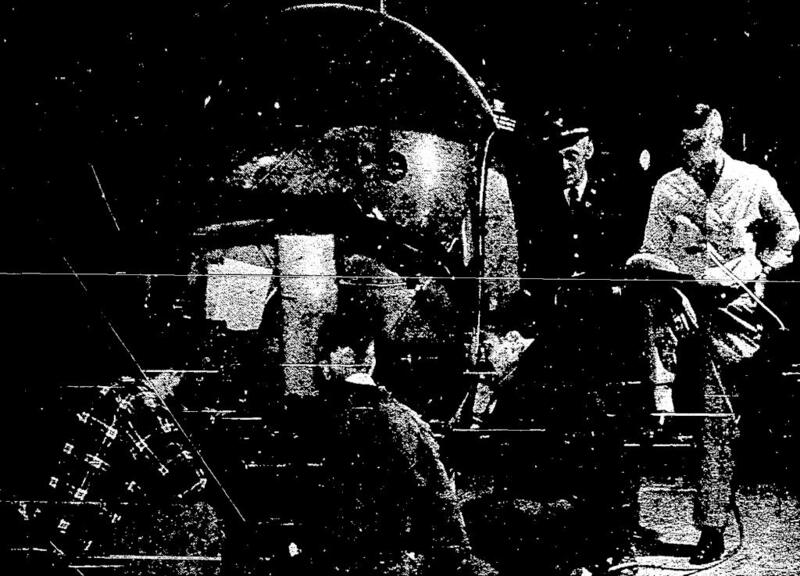 with what appears to be a rear fuselage portion from an unidentified aircraft at left. that is where the first radar units were tested after their development. Other than the metal outer skin, there is no metal in the building & the interior is all wood." but I am not sure the status of that effort." and a new hangar & helipad having been built just northeast of the odd-shaped buildings southwest of the runway. and a replacement helipad having been constructed on the east side of the 2 hangars. along with the recent-construction National Guard hangars & helipad, along with a sole UH-60 Blackhawk. bringing the facility full-circle in a sense.